Our day at Beihai Park encompassed so many fun adventures–riding around the lake in the Duck Boat, dancing and seeing beautiful pagodas. Seeing a bell tower, I forked over 10 RMB a piece to climb the stairs and ring the big brass bell. The attendant pantomimed ringing it 3 x per person for luck in the new year. We let Patti do the honors and my ears are still reverberating. Climbing down the narrow stairs, we decided they were made for local feet vs. our big old soles. 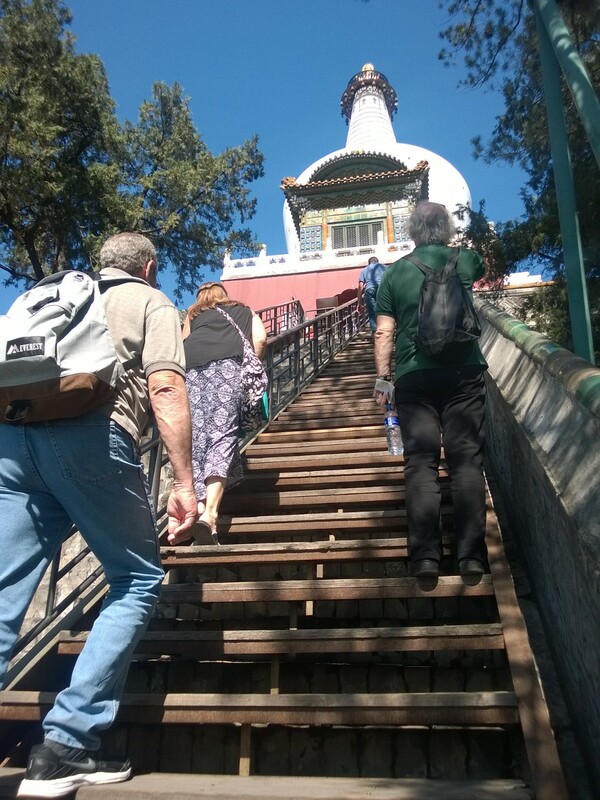 Just like my other size dimensions, I am considered large here but looking forward to being average to small back in the U.S.
69 Steps to the White Pagoda! Climb baby climb! After the 69 (yes, Patti counted them) steps up to the White Pagoda, we enjoyed the view of the lake and park and heard beautiful music being made so off we went next to find the source of the pleasant sounds. Nearing the lake shore, we saw a crowd gathered and investigated to find the music blasting and more dancing going on. Two lovely ladies in red were delighting the crowd with their graceful moves. Kids joined in and everyone watched as they graced us with their presentation. It’s moments like these that celebrate the happiness of small things and joy in movement which I will always remember about our time in China. Think I could get Seattlites to dance more in the parks…in the rain? Maybe choreograph a routine with umbrellas? After a rest and a pretzel we had scavenged earlier from our hotel breakfast, we went to look for a rickshaw ride. Not wanting to slow down for lunch (more people put food as a priority but we do not-a practice that Patti and Larry are getting used to but probably not loving), Thom and I munched on the energy bars, fruit and water that we always carry with us to eat on the run to save time and money. Patti and Larry had wanted to go on a rickshaw so despite Thom’s insistence that he never, ever was going to do this tourist trap ride, we found two gents reclining on their rides waiting for a fare. As the negotiator for our group, we had decided that 100 RMB would be our highest rate to pay and that’s what we got our rides to agree to. Patti was afraid that the old guys would have a heart attack pedaling our asses all over the hutongs but luckily they had electric bikes so no one was killed on our journey, though we did almost become bus fodder when our dude defied the odds crossing the street just as a big one tried to kill us. Guess it wasn’t our day to die as the rickshaw hit a burst of speed and just barely evaded it. Rickshaw Romance with my one true love! We flew into the hutong in our electric rickshaw but stopped several times for photos, especially after our driver became enamored with Thom’s cool 1020 Nokia phone to take the pictures. He wanted us to do several poses each time and then review his results with Thom. 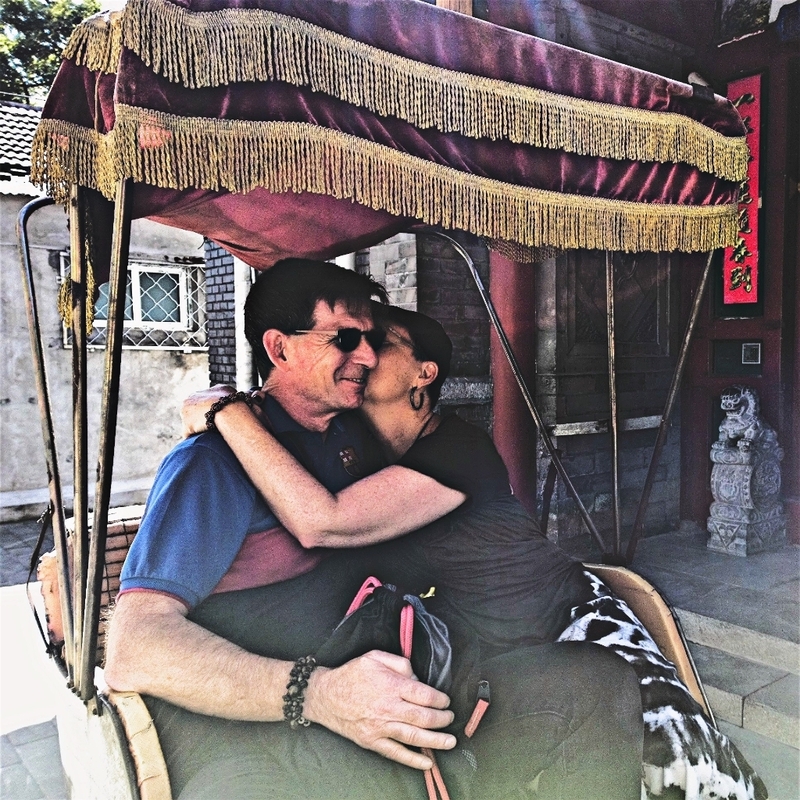 After stopping for a pose at a classic red door and then into a hutong courtyard, we ended our ride with lots of smiles and thank you’s. Thom admitted he had a good time and it was a nice way to support the local economy. Very romantic and a ride I won’t soon forget! Shanghai Farewell Tour-What The Duck!